I'm in a crafty-craft sort of mood this week. Today I'll show you an adorable homemade greeting card, part crafted by me, part crafted by my daughter. My daughter, Grace, likes to quill paper. She taught herself how to do this with books from the library. And for those of you interested, she's going to write a tutorial on simple paper quilling in the next week or two. For this greeting card (a birthday card for a friend of mine), she quilled a Gerbera daisy. Didn't it turn out cute?! She said that it took her about 10 minutes to make. I used craft cement (the rubber cement-y kind) to adhere it to the part I did. I used a card blank and cut a rectangle of scrapbook paper for the front, and glued down with glue stick. To get the glue stick on the paper as smooth as possible, I rubbed the glue stick all over the back of the colored paper, then used an old credit card to scrape the glue across. I didn't have the right shade of green ribbon to go under the flower, so cut thin strips of green paper. I glued these on with glue stick. Then I used the craft cement to adhere the paper flower on top. I based this idea/design on a Thank You card that a friend had given to me. Her card has a fabric flower and ribbon glued to the front. Our card was inexpensive to make. The card blank, I bought in a package of 50, on sale for about $5, was 10 cents each including the envelope. 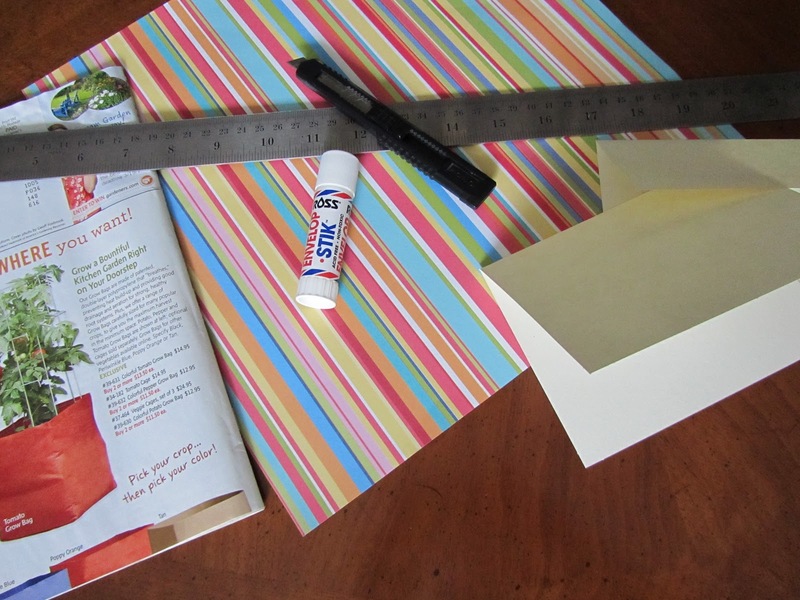 The scrapbook paper was 59 cents, but can be used for about 9 cards in total, so 7 cents per card. The paper for quilling and glue, maybe 5 cents -- so for about 22 cents, a very nice card with a homemade touch! (Just an FYI, you could cut card stock yourself to make your own blank. If you cut it to the size of a standard envelope -- there's no rule that says a greeting card has to be the shape and size they often are -- your card and envelope blanks could cost even less. And if you used colorful card stock from a craft store, you could skip the colorful scrapbook paper altogether.) 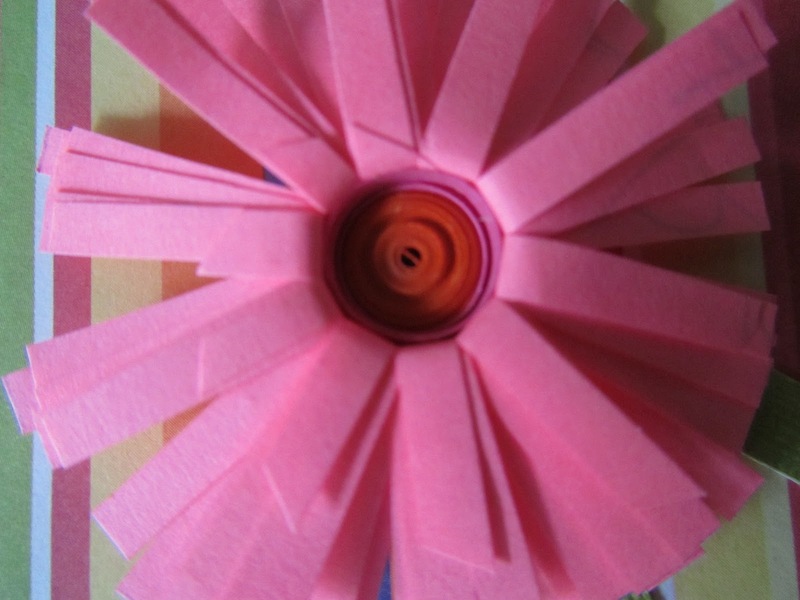 The quilling papers can be bought pre-cut, or you can do as my daughter often does, cut your own. The pink petals on this flower are actually the backside of a choir bulletin from church. Grace made a whole collection of flowers this past week, and I'm kicking myself for not taking a photo of them. She hot glued each one onto a bobby pin to give to the girls in her dance class on the last day of their recital, this past weekend. Each flower was different and unique. It was quite impressive. 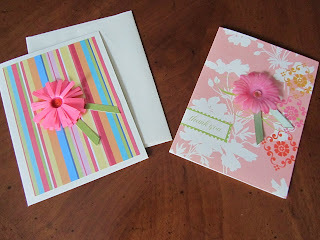 For another quilled project see Querly quilling -- floral greetings. Ah the flower is so cute!! Thanks, I'll tell Grace. She'll be thrilled that you said so! Thank you. I'll be checking your blog to see what fun crafts you do. We love the crafts, and summer works out to be a good time of year for us to do these sort of things. Cute cards! I'm always happy to come across someone else who enjoys quilling. Thanks. I'll tell my daughter you liked it. She really enjoys quilling. I'm so sorry that I haven't gotten to the quilling tutorial, but I definitely plan on doing it in the next week. I'm really looking forward to it; thank you so, so much for letting me guest post!! !